Inspect threads and replace if stripped or damaged. Inspect for cracks in both grips and stripped threads in the left grip. Replace if defective. Inspect for kinked, set, or broken springs. Replace if defective. Inspect release camming area for wear if positive retention is questionable. Replace the release. Inspect release for bends. Repair by straightening or replacing, as required. Inspect blade assembly for nicks, breaks, or dents. Repair by grinding and/or stoning. The length of the blade (measured from the front face of the guard) must not be less than 6 1/8 inches after repointing. Nicks on the cutting edge not exceeding 3/16 inch in depth may be removed by grinding. Ground areas shall be blended into adjacent surfaces. Inspect plates for 6-1/8 _ looseness. Stake or peen to INCH MIN tighten. 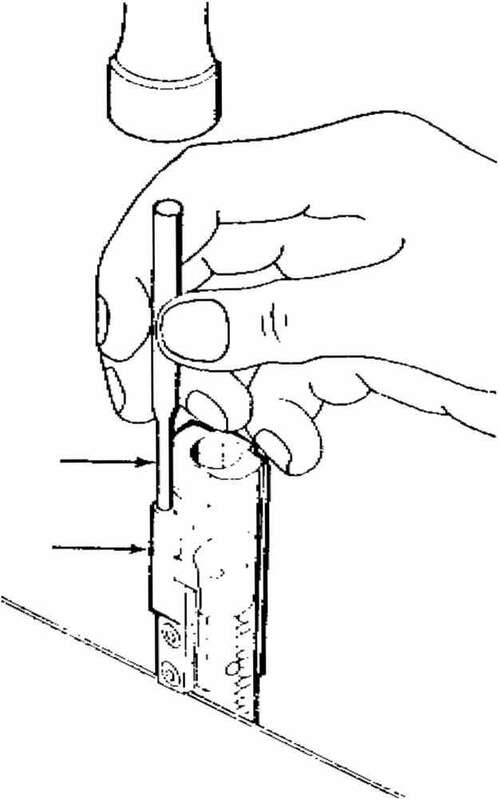 If unable to tighten, spot or arc weld. Make certain when repairing that sufficient clearance exists after repairs to permit positive retention of bayonet to the rifle.